There have always been stories documented from early explorers about strange wonders seen in the deepest reaches of space. The ones longest discounted were reports of behemoth spaceships that would vanish in a flash of light and energy when sighted. These reports resurfaced and became the focus of an exploration team from the Matar Spaceship Logistic Team, a subsection of the Republic Fleet Fleet Shipyards. Spurred by a Cold War, this team dove deep into the cold depths of null security space. By coincidence or luck, they discovered two specimens locked in a battle. After the fight, the winner, heavily injured, was captured and the presence of a dreadnought genus spaceship established. The Naglfar possesses an unusual structure for spaceships. It stretches vertically across the Y axis, giving this spaceship a striking image. Of slow speed and moderate aggression, the Naglfar is a mighty presence on the battlefield. However, it's poor sensor strenght causes it to not notice frigates and cruisers unless they are brought specifically to its attention by its handler. Its size, and massive projectile turret assembly are better brought to battle against other dreadnoughts and larger spaceships or structures. With the use of liquid ozone, a dreadnought can be tantalized into entering into a physical siege type mode while it consumes its feed. This physical lock down also causes it to gain greater accuracy and resistance to damage. However, it cannot be pulled from its feed too soon and only well experienced handler's will attempt this in the middle of battle. Dreadnoughts are not capable of using jump gates for transportation. Instead, these creatures have developed their own, internal drive that allows them to cross a handful of light years in one flash of energy. They must consume massive amounts of isotopic fuel. These details bring validity to reported sightings of dreadnoughts in asteroid and ice fields. Placid in temperament, dreadnoughts have been banished from the heart of empire space due to their incredible appetites. A herd of these creatures can easily eat through a systems resources in days causing a cascade of drought and famine behind them. While social in nature, handlers rarely can maintain more than one or two of these great beasts. Dreadnoughts are also highly social. 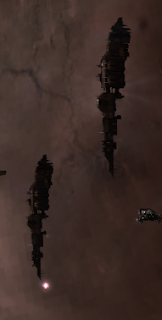 They often have a symbiosis pair with smaller ships that live off of their kills. These smaller ships are known as cynosural spaceships or cynos for short.